Tables being updated live. Please refresh for updates. For more information on the Nielsen Ratings see this Wikipedia Entry. NOTE: The opinions expressed here are NOT those of SpoilerTV but of the Author of this Article, Marc Berman. Note: The following labels are based on the household overnights and are subject to change given the availability of other pending data streams. As always, these overnights are your first look at the ratings and a precursor to what could lie ahead. And we take into account other benchmarks including the expected demographic ratings, potential DVR usage, the critical acclaim (or lack of) and the social media presence. CBS got over the Wednesday “hump” in winning overnight fashion, besting second-place ABC and NBC by an average of 23 percent. But the home of “Modern Family,” ABC, should have no trouble narrowing the gap in all the key young adult demographics. The real question is how episode one of “Stalker” fared demographically. In series-premiere news, crime solver “Stalker” on CBS won the 10 p.m. hour with a 6.0 rating/10 share in the overnights. Comparably, this was right on par with year-ago occupant “CSI,” which resulted in 9.66 million viewers and a 2.1 rating/6 share among adults 18-49, based on the Live + Same Day data. And overnight retention for “Stalker” out of the 9:30 p.m. portion of lead-in “Criminal Minds” (7.5/12) was adequate at 80 percent. But given that most new series drop 10 to 20 percent in week two (see “Black-ish” on ABC below), time period dominance does not always warrant being labeled a “winner.” And this is actually a disappointing start – at least in the overnights – for “Stalker.” Let’s wait and see what the demos and DVR usage looks like. The 10th season-premiere of the Eye net’s aforementioned “Criminal Minds,” now featuring Jennifer Love Hewitt, scored an overnight victory from 9-10 p.m. with a 7.5/12. Comparably, that topped the evening with minor growth of four percent from the 7.2/12 on the year-ago evening. At 8 p.m. on CBS, meanwhile, was veteran “Survivor” at a solid 5.8/ 9, which was equal to last week’s 90-minute season-opener and six percent below the year-ago evening. The 5.8 in the overnights on Sept. 24 translated into 9.75 million viewers and a 2.7 rating/9 share among adults 18-49, based on the Live + Same Day data. Earlier in the evening on ABC was “The Middle” (#3: 5.2/ 9) into compatible “The Goldbergs” (#3: 4.9/ 8), which bested failed year-ago occupant “Back in the Game” (4.7/ 8 on 10/02/13) by four percent. And “Nashville” capped off the night with a typical third-place 3.9/ 7 at 10 p.m., which was equal to its week-ago season-premiere (which only translated into a 1.5/ 5 rating in adults 18-49). In episode three news, NBC Debra Messing drama “The Mysteries of Laura” remains a surprisingly positive total viewer entry, with a dominant 6.1/10 at 8 p.m. Comparably, that was just eight percent below its time period debut last week (6.6/11 on Oct. 1) and it beat year-ago occupant “Revolution” (3.9/ 7 on 10/02/13) by a hefty 56 percent. But, looking at the entire picture, that 6.6/11 in the overnights last week only translated into a 1.5/ 5 among adults 18-49 (with 10.01 million viewers overall), based on the Live + Same Day data. And NBC may not necessarily be a fan of “The Mystery of Laura’s” older audience skew. Remember the premature cancellation of similar appeal “Harry’s Law” with Kathy Bates in May 2012? Next on NBC was veteran “Law & Order: SVU” at a third-place 5.3/ 8 at 9 p.m., which was eight percent above the 4.9/ 8 on the year-ago evening. And sophomore “Chicago PD” followed with a second-place 4.3/ 7 at 10 p.m., which was 19 percent below its 5.3/ 9 season opener one week earlier and 14 percent below the series debut of the failed revival of “Ironside” on the year-ago evening (5.0/ 9 on 10/02/13). Retention for “Chicago PD” out of the 9:30 p.m. portion of “SVU” (5.4/ 8) was 80 percent. On Fox, “Hell’s Kitchen” perked up a bit to a 3.1/ 5 (#4) at 8 p.m., which was 15 percent above the 2.7/ 5 one week earlier. But, versus year-ago occupant “The X Factor” (5.6/ 9 in the time period on 10/02/13), it was still down by a significant 45 percent. And it led into a 2.6/ 4 in the overnights at 9 p.m. for “Red Band Society” at 9 p.m. (#4), which equaled episode two one week earlier. And that translated into just 3.43 million viewers and a 1.1/ 3 among adults 18-49, based on the Live + Same Day data. Capping off the night were two encore telecasts of “Arrow” on The CW at a very non-competitive 0.6/ 1 from 8-10 p.m. Next week, look for the season premiere of “Arrow” into a repeat of the pilot episode of spin-off “The Flash” (which debuts next Tuesday). Later on (normally between 4pm-5pm GMT) we post the official early overnight Total Viewers and 18-49 Demo numbers in the table above. Finally, later in the evening (10pm-11pm GMT) or the following day, the final adjusted ratings numbers are released, these are then posted in the Ratings Database. The Final Adjusted numbers are what we use for all our Renew/Cancellation Tables, Full Season Tables, Ratings Scorecards etc (see below). Friday's Final Adjusted Ratings are normally available on the following Monday. If you’re interested in Ratings/Renewals/Cancellations then we have a number of resources here at SpoilerTV that we recommend you check out. Our Cancellation/Renewal predictions for the current season. Historical Ratings Database for nearly all major US shows going back to their first episodes. 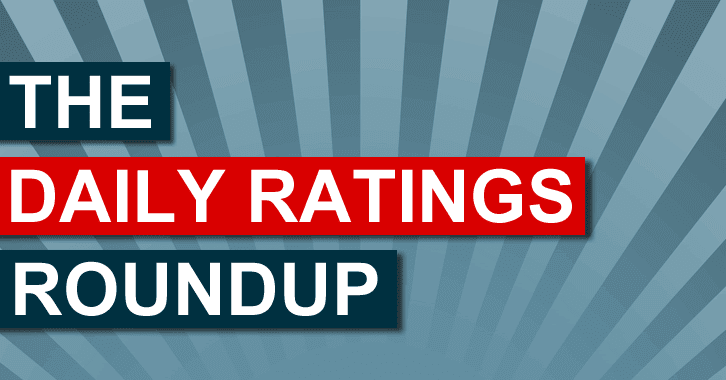 See how all the shows stack up against each other in the Ratings Scorecard Table.